Mower General Hospital, Chestnut Hill, Philadelphia. John Moran Collection of Photographs. Philadelphia : sans publisher, sd (ca. 1863). Description : overall 23 x 30 cm. (9 x 12 in.) or smaller. Repository : Library Co. of Philadelphia, Print Dept. Subject : Medical Corps ; Hospitals — Military. Titles inscribed on mounts and on versos. Eighteen of collection contain photographer's imprint inscribed on mount. Eighteen of collection contain manuscript note on verso : "Chestnut Hill Hospital." Stereographs on yellow mounts with square corners. Date inferred from transcription of Coleman Sellers Letterbook, entry August 15, 1863, John Moran research file. To view the other images in this portfolio, go to The Library Company of Philadelphia and click on "Featured Collections" on the drop down menu. See also John Moran's photographs for the volume, Hospital of the Episcopal Protestant Church. Mower General Hospital, built in 1862 after the designs of Philadelphia architect John McArthur, Jr. between Stenton, Germantown, Springfield and Abington avenues opposite the Chestnut Hill track of the Reading Railroad (7900-8000 blocks Stenton Avenue) received injured soldiers transported directly from the battlefield between January 1863 - May 1865. 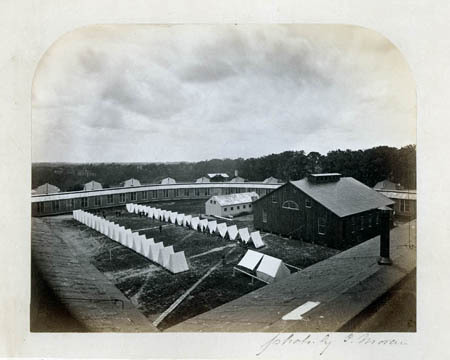 The hospital, designed as a pavilion to control the spread of infection, consisted of several hospital wards radiating from a central enclosed complex of administrative and utility buildings. Complex included the administration building, a chapel, post office, band-stand, food preparation shops and storage houses, a barber shop, dining room, and guard house. 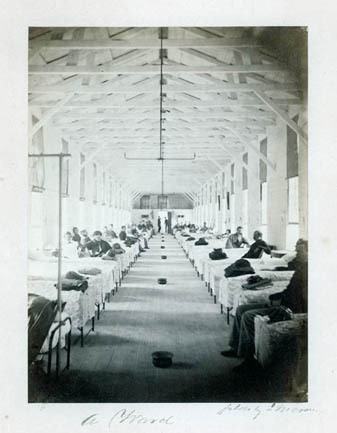 Hospital utilized fresh water from the Chestnut Hill water works, gas lighting, and indoor plumbing. Building was razed following the war. From the Observatory looking southwest.